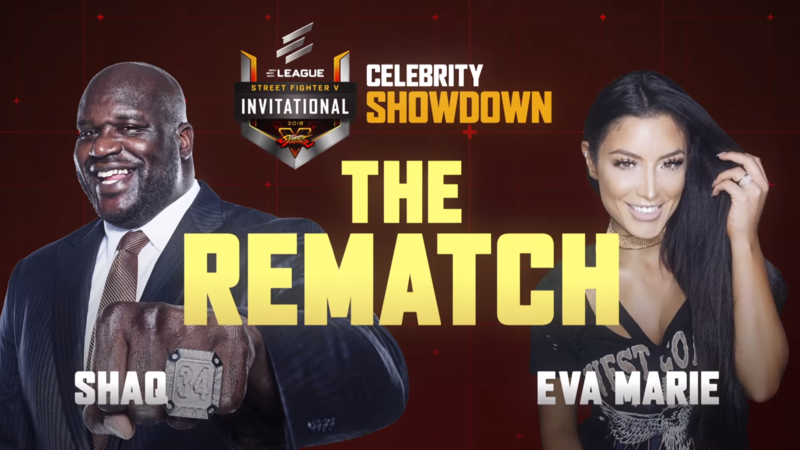 The ELEAGUE Street Fighter V Invitational Celebrity Showdown is back and so are Shaq and Eva Marie. With the ELEAGUE Street Fighter V Invitational taking a week off before the bracket stage, what's next for Turner's big fighting game tournament? It's time to bring back the celebrity players, of course, as a foursome of celebrities enter the Turner studios to face off in Street Fighter V: Arcade Edition. Last year's ELEAGUE Street Fighter V Invitational Celebrity Showdown ended with Natalie Eva Marie, the former WWE Diva, getting the better of NBA legend and Inside the NBA jester Shaquille O'Neal. This year, both of them are back and ELEAGUE is heavily promoting their inevitable rematch. They'll be joined by former NBA veteran Baron Davis and former World Series champion Jimmy Rollins. The four celebrities will compete in a single-elimination tournament, with their prize money going towards charities of their choice. Big Shaq is playing for the Odessa Chambliss Quality of Life Fund, Eva Marie is playing for A21, Rollins is playing for The Jimmy Rollins Family Foundation, and Davis is playing for The Drew League. The ELEAGUE Street Fighter V Invitational 2018 Celebrity Showdown will take place Friday, June 29 at 8PM PT live on TBS.